Runs and drives excellent and is in great condition. Two Owner Car History From New: In 1971 I was four years old and our family bought Saga Hedlund's 1967 250SE coupe as she was moving to Finland. Importing a used car into Finland was more expensive at the time than bringing in a new car so she bought this 1971 3.5 coupe new from European Motors LTD on 1740 Van Ness Ave San Francisco California and immediately had it shipped over to Finland. Saga kept extensive documents including the original sales person's card and first trip permit, and maintenance records. The owner's manual is the nicest one I have ever seen I don't think it was ever touched till I pulled it out last week. Our family drove Saga's 1967 250SE coupe for 17. 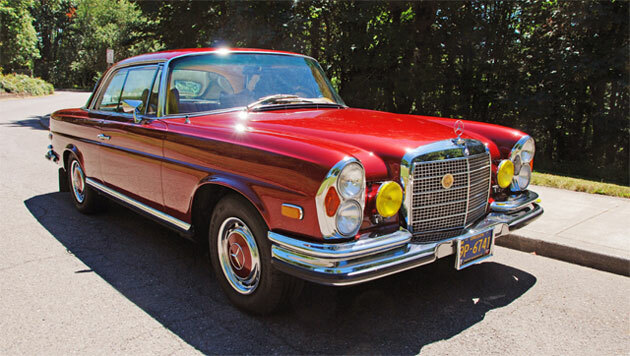 Fast forward 25years to 1996 and the 1971 3.5 coupe returned to Oregon after Saga past away. By lucky chance I got in contact with her son and went to look at the car in Grants Pass Oregon and bought it on the spot. I have owned the car since 1996 (21 years). These cars were built less than two years from August 1969 to July 1971.This car was built in November 1970. 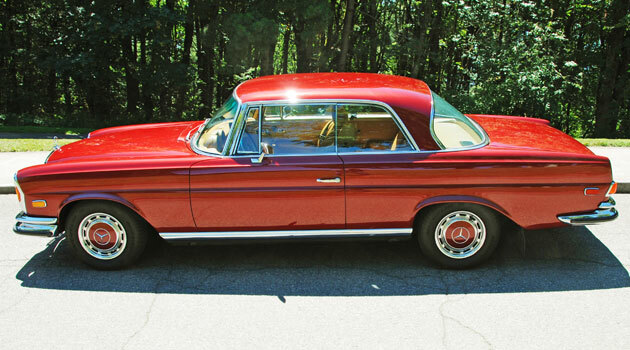 Only 3,270 coupes were ever built. This car has never been hit, never any rust, total history from new and is in amazing condition, a real pleasure to own and drive. Engine & Transmission: mechanics are very well sorted. engine starts immediately, automatic transmission shifts smoothly, maintained very well over the years with records from new. The car is responsive, nimble and enjoys long-distance cruising. The Bosch electronic fuel injection works excellent and the car runs strong. This is a great example that is ready to drive and enjoy. Body: Rust free, extremely solid body and frame. Straight with no dents or waviness, excellent gaps. glass is in exceptional shape no chips or cracks. Saga had the car painted in Finland from the original tobacco brown (423 H 1968-1971) to a lighter cream color, although it was a high quality paint job it was not my favorite color. After a few years I had the car painted to show quality standards (571H) red. I am a stickler for originality but since the car had already had a color change I felt ok picking a color I liked. I have a high standard for paint and am use to looking at Pebble Beach quality cars. The finish is superb, deep and lustrous and free of imperfections. I would grade the paint a 9 on a scale from 1-10. All the chrome is exceptional no pitting. The rubber is fresh and all lenses are great. The trunk is very nice never had any rust. This car has been stored in a temperature controlled garage all its life on both sides of the globe. jack, tools, and correct vented steel rim spare tire. underside is solid and untampered (see photos). I have taken great care owning this car. 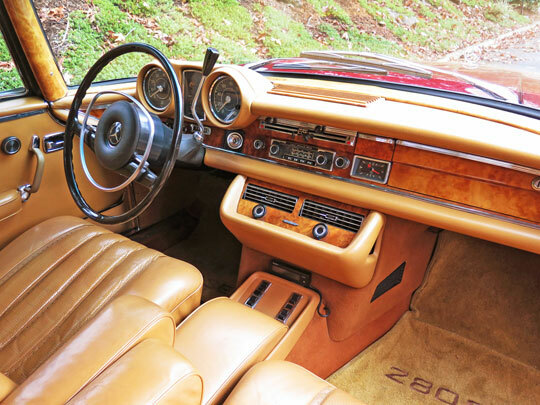 Interior: The beautiful original leather interior is clean and in very nice condition. wood is in very good condition with some slight fading on the dash parts. chrome bits are like new. All the gauges work as they should with exception of the clock, Original radio, black steering wheel is mint. Turn signals work as they should. The original carpet is great. A/C, power steering, power brakes, electric windows all work as they should. The headliner on this car is very nice. 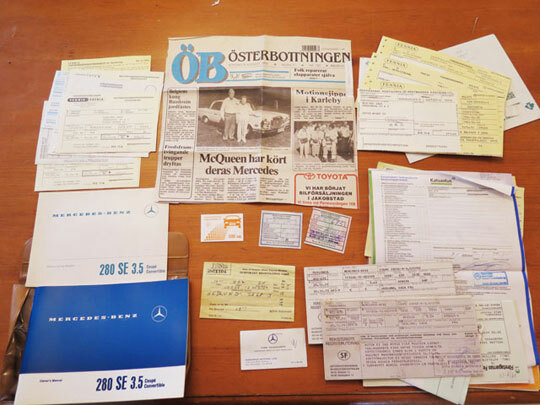 Interesting Note: In the documentation that came with the car there's an article on Saga and her husband in the local Terjärv Finland paper that states Steve McQueen drove Saga's 3.5 coupe. . 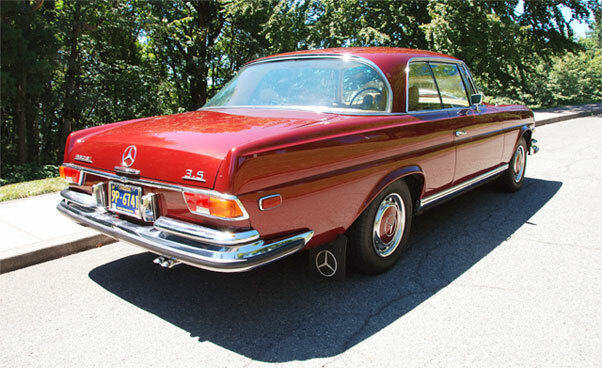 This is amazingly solid example of a classic Mercedes-Benz. These extremely comfortable tourers are considered highly usable classics continuing a tradition of handcrafted quality and superior engineering, Even cars twenty years newer will be hard-pressed to match the 280SE 3.5 for its quality, performance and unrivaled style. This car is perfect for cruising during the week and taking to car shows on the weekend, an exceptional numbers matching example with full documented history from new.